There was a moment of victory seconds before the announcement of the winner when one or two members of the audience shouted ‘Swagene’! Earlier in the afternoon when close to 30 people had personally appreciated our talk, I had already conveyed to our team back in Chennai that if there were an audience award, we would nail it. And then at the very end of the evening, when Swagene was announced winner, it was indeed surreal. Having won both the CII award where the judges were entrepreneurs and businessmen, and the DST-Lockheed Martin award where we were judged by reputed business schools (Stanford, University of Texas) and industrialists, winning Conquest judged by eminent investors and venture capitalists has brought us full circle, as well as a lot of conviction and strength from being validated by different genre of accomplished people. Swagene is now looking to raise funds to accelerate molecular diagnostics in two ways: one, to make them available, accessible and affordable, and two, to bring the most advanced diagnostics to the market. Thank you very much to the entire team behind Conquest, the students of BITS Pilani, primarily Parth, Shavak, Srikanth, Anish, Jai, Nilesh, Devanshi and others for conducting the competition in such brilliant fashion. At the Bangalore mentoring session, I had already appreciated them for the format and their dedication when they stayed late to accommodate our sessions. The main event has been thoroughly appreciated by the judges and several others for the entire day, and particularly for the jury-audience interactive session. The snippets below from various newspapers aptly describe the gargantuan effort behind, and the consequent success of, Conquest 2015. After a month of careful evaluation, the top 50 startups were selected from amongst 1,400 registrations. Based on the responses filled, 50 were shortlisted to attend networking sessions in New Delhi, Bengaluru and Mumbai. The winners were picked up by a jury which included Dev Khare, managing director, Lightspeed Ventures; Nilesh Kothari, co-founder, Trifecta Capital; Murali Natarajan, managing director and chief executive, DCB Bank; Bharat Shankar and Ankit Arora from Accel Partners and Anant Vidhuri of Bessemer Venture Partners, Mathieu Morand, investment associate at Bessemer Venture Partners, Tarun Davda, director, Matrix Partners and Rajat Tandon, vice-president, Nasscom. 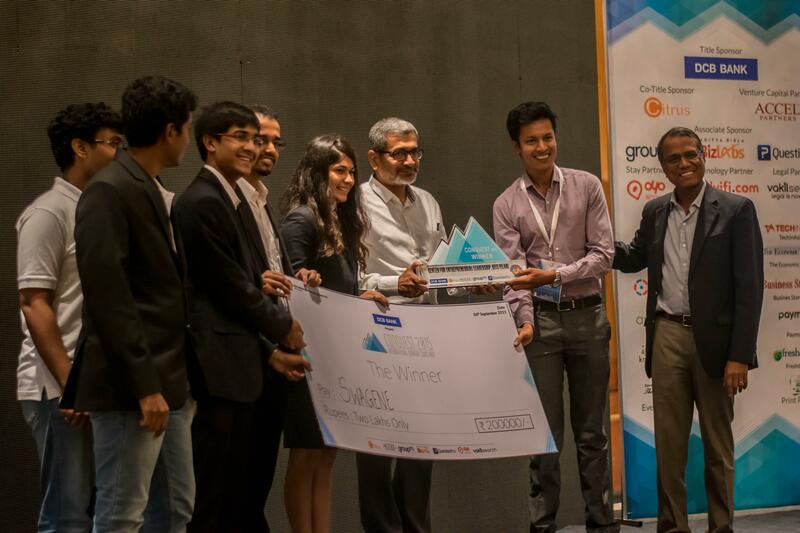 After a grueling contest among budding start-ups, healthcare venture Swagene pipped over 1,350 other entries to win the 11th edition of Conquest at the BITS Pilani’s International Startup Conclave in New Delhi. In the grand finale, these 10 finalists pitched their ideas to VCs and potential investors giving a glimpse of their business models, target areas and challenges. The audience consisted students from various institutions who aspire to start ventures of their own by learning from existing business models.